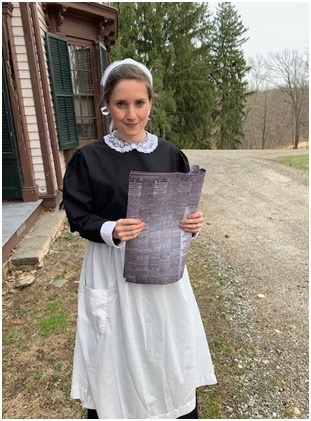 History-Inspired Theatre at Fosterfields Living Historical Farm - 4/13/19 ~ The History Girl! Although I am a trained historian and museum educator, I consider myself primarily a storyteller. Like probably all of us in this field, I became interested in history not because I was obsessed with facts or dates--but because the authors, researchers, journalists, screenwriters, exhibit designers, museum educators and park rangers whose work gave background to my childhood were concise and compelling storytellers. As I grew in my history career and tried to be the same type of public historian who inspired me when I was younger, I worked on cultivating not only my research skills, but honed my storytelling practice through creative writing projects. I knew that in order to be a successful public historian, it was just as important to be a thoughtful and analytic researcher as it was to be a compelling storyteller. Last August, I moved into an exciting new role as the Senior Program Specialist at Fosterfields Living Historical Farm. 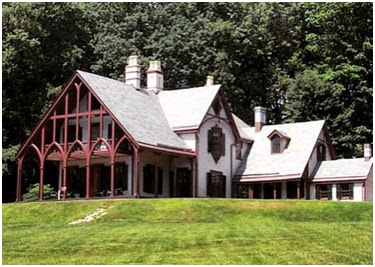 For those of you unfamiliar with Fosterfields, we are a 200-acre living history farm located in scenic Morristown, New Jersey and we interpret all the complexities of life on a 20th-century American farm. Walking from one end of the farm to the other, you pass a transportation exhibit featuring early 20th century cars, a stunning and well-preserved Gothic Revival mansion, cows, sheep and pigs in the pasture, a smaller 20th-century farmhouse, farm outbuildings, and a Visitor Center with a rotating exhibit space. We are inspired by the legacy Caroline Foster, who donated us the farm to ensure the place she lived 99 of her 102 years in would be kept as a window into the incredible world she inhabited. Put in short, there are many stories to be told at our site, and it’s an honor to be in a position to tell these stories. The majority of our visitation happens during our six major annual special events, so in my first year in this role, I wanted to include different types of stories and storytelling in these events. In November during our Armistice Day event, we piloted a new type of programming: museum theatre. While many museums do various types of first-person interpretation and living history, we wanted the experience to resemble attending a high-quality theatrical production. I chose our Armistice Day event as the first pilot of the museum theatre program for a couple of reasons, such as the extra attention paid to the hundredth anniversary, and the wealth of historical stories related to World War I in Morristown. However, the main reason was that I had seen in the past four years over the World War I centennial how people were interacting with World War I--with engagements with dramatized projects such All is Calm: The Christmas Truce of 1914 and Jeremy Doller’s We’re Here Because We’re Here massive public performance project across the U.K. For our November program, I wrote characters--with the exception of one--who were composite characters, based on real-life people and telling general stories to the area, but not based on specific individuals. We partnered with volunteer actors at a local community theatre to bring the works to life. While we were nervous about how our audience would adjust to a type of interpretation that was so different than what we normally did at our site, and the content was more mature than our usual child-centric programming, the audience loved the performances. With the success of our first museum theatre program, we decided to implement the program a second time, during another event. Fosterfields is on the New Jersey Women’s History Trail because of the contributions of Caroline Foster to Morris County, but Caroline wasn’t the only inspirational woman who lived at Fosterfields. During the early years that the Fosters lived here, dozens of Irish women worked as live-in servants at Fosterfields, placed by employment agencies. While many of the workers were transitory, staying often for only a few years or months before moving on, some of the women worked at the Fosters for years, and their names periodically appear in diaries and journals connected to the site, as well as in pay stubs, employment letters and other archival materials. However, all in all, the records around these women are scarce; of our collection of other 800 photographs, the actual servants only appear in two. Incredibly, there are more photographs of Caroline and her friends in a play, acting as servants, than there are of actual servants. 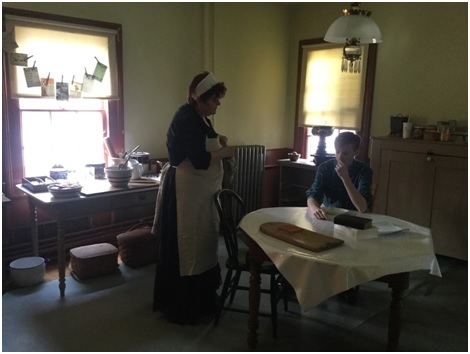 In order to “fill in the blanks” in the archival record for our special event honoring the workers at Fosterfields, Workers on the Farm: the 1900s Immigrant Experience we wrote three new vignettes, staged inside the Gothic-Revival historic house museum the Willows. We will debut these works on Saturday, April 13. Actress Kathleen Mallon portrays a servant reacting to a series of publicized letters in 1907 pitting servants against their employers. The first vignette will tell the story of “the Marys”--Mary Cullinane and Mary Fennessey, the first two Irish servants Caroline Foster remembers living with the family at Fosterfields. In the scene, the Marys reflect on their life together, and overall trends about Irish immigration at the turn of the century. At the end, a docent will display primary sources explaining the “epilogue” and fate of the characters we meet. The second vignette recounts the “Honesty” letters of 1907, in which a disgruntled housewife complained in the local Jerseyman paper that Irish servants were extorting American housewives by charging too much for labor. Each scene is pieced together with a docent, who can answer content-based questions our actors cannot, and who breaks the fourth wall, sharing with the audience the research process. The docents also provide background information and transition as the scenes take us through many years of Fosterfields’ history. Finally--and this was important--they provide maximum transparency, showing copies of the primary sources that informed the performances and telling the audience point-blank what sections of the script are imagined because we just don’t have the documentation to tell us more. 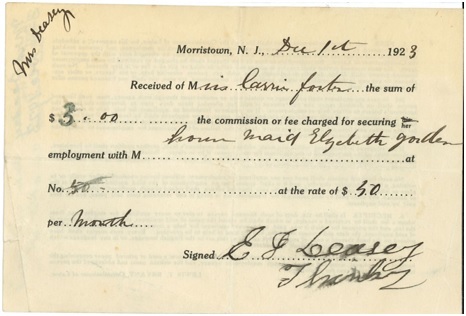 Employment agency receipt, courtesy Morris County Park Commission collections. Documents like this are often our only source of records for the servants held in our archival collections. Actors in conversation with other actors can bring up thought-provoking and challenging ideas in non-confrontational ways, and have forced us a historic site to embark on research and conversations we otherwise would not have . Take the way that we tell the story of Lizzie Carroll, for example. Lizzie Carroll was the Foster’s long-term cook who appears for fourteen years in check receipts, payment records, the occasional line of Caroline Foster’s diary, and the census. Lizzie immigrated from Ireland in 1900 and worked for the Fosters from 1905 to 1918. For many years, the story we told visitors was that Lizzie was a divorced mother of two sons, based on handwritten notes a staff member took more than 20 years ago. However, when I revisited the census records while doing research for the vignettes, I found that Lizzie was actually marked widowed, not divorced. More importantly, I also found the names of her children--names that intrigued me because as a live-in cook, it was unlikely that Lizzie would have been permitted to have her children live at Fosterfields. Tracing their names and dates of birth, I found the boys at St. Mary’s Orphan Asylum in Newark in the 1915 census. However, by the 1920 census, the family is once again living under the same roof, mother and two sons, while the son Thomas works as a gardener. In the scene I wrote, Thomas Carroll comes to Fosterfields to tell his mother that he has gotten a job in Morristown. It’s not based on an incident that I know happened in real life--and our docents introducing the museum theatre piece are honest with our audiences in telling them what source material I used, how I used it, and that the scene is conjecture based on the historical facts we do have. But the scene is emotionally riveting, and opens up conversations about the history of immigrant family separation--a conversation resonant to visitors of today. Annette Winter plays Lizzie Carroll, while Joseph Dunne plays her son Thomas. In a small museum, especially when managing a staff and serving thousands of children through school programs each year, it can be difficult to find time to research, and to see the larger connections between the events of our site and the larger-picture of greater New Jersey and world history. But researching these scenes and writing these scenes gave us an avenue to amplify historical stories that we had already researched and share them with a new audience, as well as forced us to take the time to go back to our archival records and other local repositories (such as the Morristown-Morris Township Library). Actresses Gianna Esposito and Cheryl Bookstaver play Mary Cullinane and Mary Fennessey. Join us for this unique experience on Saturday! "Workers at the Farm: The 1900s Immigrant Experience" starts at 11:00 a.m. on Saturday, April 13 at Fosterfields Living Historical Farm. The event begins with drop-in farm activities such as cow-brushing, animal talks, musical performances, and planting. The performances begin at 1:30, and there will be five separate performances throughout the day. Tickets for the performance must be picked up at the front desk and are space-limited, first come, first serve. If you have any questions, please call 973-326-7645. Alli Hartley-Kong is the Senior Programs Specialist at Fosterfields Living Historical Farm in Morristown NJ. Although Alli is a NJ native, she spent the past seven years living and working in the Washington D.C. area and has consulted for museums internationally. She has authored articles for the Canadian Museum Association journal, the American Alliance of Museum’s Alliance Blogs, and her writing will appear as a chapter in the upcoming book The Care and Keeping of Museum Workers.